It’s my last day in New York before I go to Austin for South By Southwest Interactive with my buddy Jon (thanks to the TelecomCareers.com contest). So I’m hanging around in my brother’s apartment today with nothing to really do, so naturally I took out my camera and made him take pictures of me in silly hats. 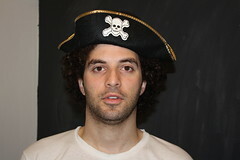 This is a picture of me in a pirate hat. You can tell it’s a pirate hat because it has a skull and cross bones on it. And you can tell it’s me because it has my face on it. But this isn’t my first foray into the world of the silly hat. Oh no, I’ve been into silly hats for a long time. From the earliest birthdays I can remember to other times that I can’t remember, I have enjoyed wearing silly hats. If you want to see my most recent work with silly hats, make sure to check out my roommate Olev in our video for the Bailout Contest. And if are wondering what to get me for emergency Christmas, a silly hat will do. « Say No to the Government Bailout? Sure, why not. You know, Paul Rudd once wore that very same pirate hat.